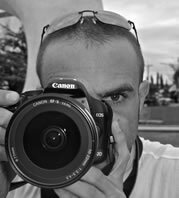 I am writing to review on my photography workshop with Adriano Trapani on Friday February 17 and Saturday February 18, 2012. I feel this was a informative workshop, giving the time frame we had to work with. We firstly went through some of my photos in the morning, and Adriano critiqued the work in the context of his own photographic style. We then discussed the composition of a photo, how to control exposure, focus and depth of field by changing the shutter speed, aperture and ISO settings. He offered many specific useful suggestions which was then put into practice in our walk around Old Phuket Town in the afternoon. The following morning we went to Kathu Waterfalls and Wat Chalong Temples. We took my friend who was our model, and this allowed Adriano to show me how to utilise an external flash with a softbox on it as well as a normal flash with a remote, and how controlling the light and directing it where you want it will give more emphasis to the main point of interest. In the afternoon we then went through the images that I had taken, and chose a few images that stood out and worked on them in photoshop. Adriano showed me how to convert RAW files and how some simple tools in Photoshop can enhance pictures in post-production. Overall, Adriano gave me the confidence I needed to pursue working in manual, as I have always photographed in auto. I feel this workshop was extremely valuable, and highly recommend Adriano to those looking to improve all aspects of their photographic knowledge, and I am looking forward to working with Adriano when he visits Australia.